The perplexities of putting an article together about fishing with direct applicable "written in stone facts" is just never going to happen. Windage needs to be adjusted to your area, lake, or port. Sorting thru what makes sense to you and what guidelines draw a tangent to your personal experiences. In the following, gleaned from my years fishing the Great Lakes since 1968, I'll do my best to maybe, just maybe help you put another fish, or two in your box. The word "maybe" needs to be used, cause with fishing the outcome is never certain until you pull lines and head for the dock, and, or hopefully the fish cleaning station. This article was put together after the 2008 season, cuz as time marches forward, things will evolve. 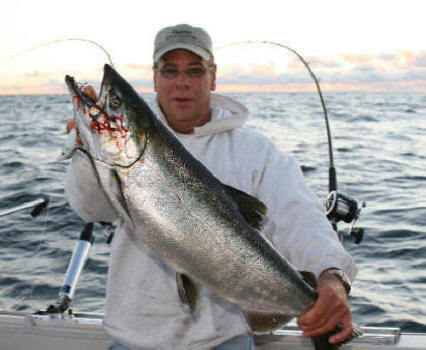 That's the reel-nature of our ever changing Great Lakes Fishery! Putting this pieces of any fishing puzzle together begins with a baseline timeframe to put the information supplied in this article into perspective. First off, you need semi-decent numbers of fish. This happens in Manistee from about the 3rd week of July thru the second week of September. Second part of this equation when using attractors is having a thermocline deep and the deeper the better, cuz deep fish do not reach peak activity levels until the sun has been up for a while. Early sunlight does not penetrate to depths of 80' and better due to the low angle of bands of light traversing at an angle ...much like fighting against the sloped armor of the famous WWII tank, the lethal Russian T4. Photo 1. top left photo shows the size difference in a Salmon belly size as they mature. 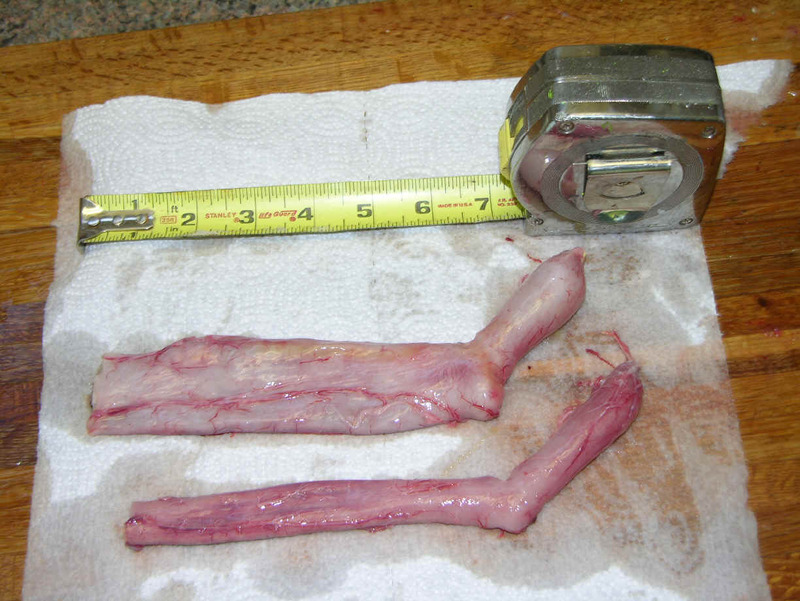 The top, larger belly shown is from an immature 3 year old King Salmon. that was stuffed full of 6 to 7 inch partially digested alewives. The bottom, smaller shriveled tube-like belly is from a 4 year old adult. 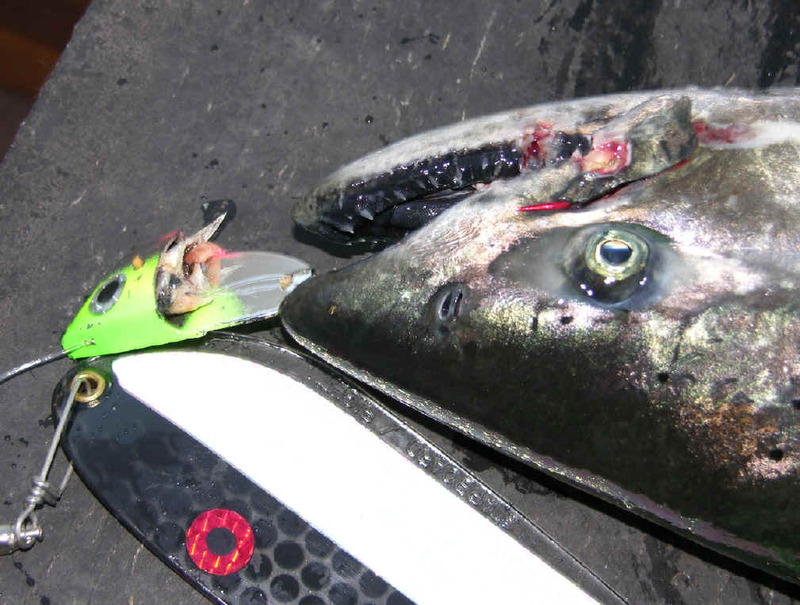 Both Salmon were very close to the same size, clones tipping the scale around 12 pounds. 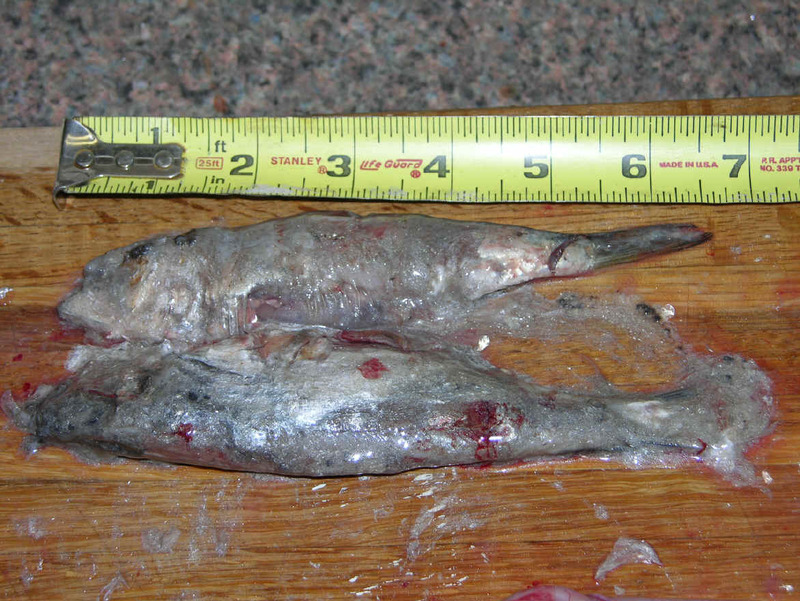 Photo 2. second left confirms the size of the alewives we had in 2008 and was removed from the exact same stomach of the immature 3 year old shown in photo 1. This photo plainly illustrates a fully adult King does not have ability to swallow any bait with shrunken/contracted gut that can't digest a meal if it wanted to. However, this full adult 12 lb. King still had the urge to hit, or how else would I have got the photo? Please take a moment, or two to click on the rest of photos in full size to gain a better insight and understanding your adversary. These are not light, tippy-tap biters, but hungry fish hell-bent on swallowing. Resulting in solidly hooked-up fish (inside the mouth) and welded to the double deadly treble hooks. Either way, these photos make a very strong point, my lacking wordsmith skills struggle to get across. If one photo is worth a 1000 words? ...this article will explain itself. 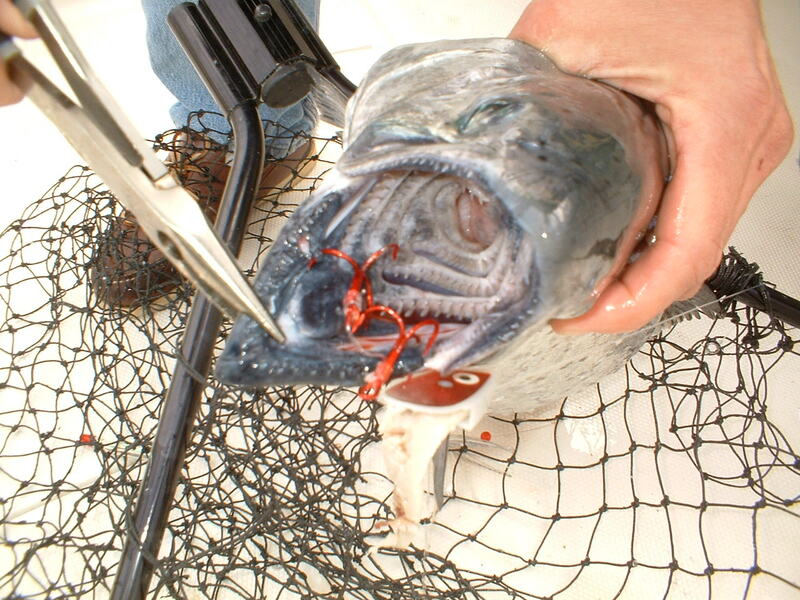 The rest of the images in this segment all portray fish that took the meat head, or fly deep down their throats and were not shy about grabbing a meal. Ambitious eaters are much easier to get hooked up. Eaters fall into a category enthusiastic to grab something to chomp on at any time of the day. 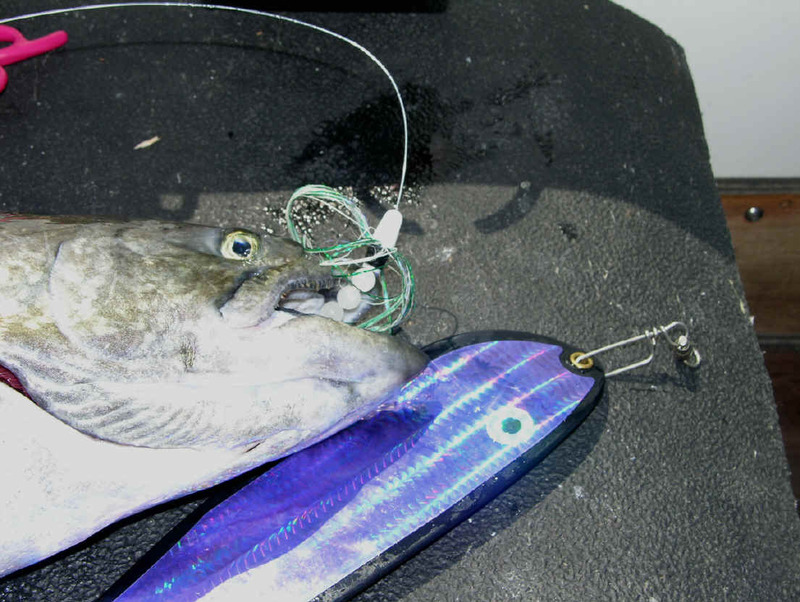 Predicated on proper lure presentation that imitates the forage base of your targeted specie. This has been a challenge to put into words. Differentiating between fish on the prowl to eat, or fish just content to slap at a meal has never been brought up before. Is this a fluke, or just a long neglected reel-fact that's never been brought into focus before? It's my firm belief two different classifications of eaters, and biters aka short strikers takes place mostly in the latter part of the summer. 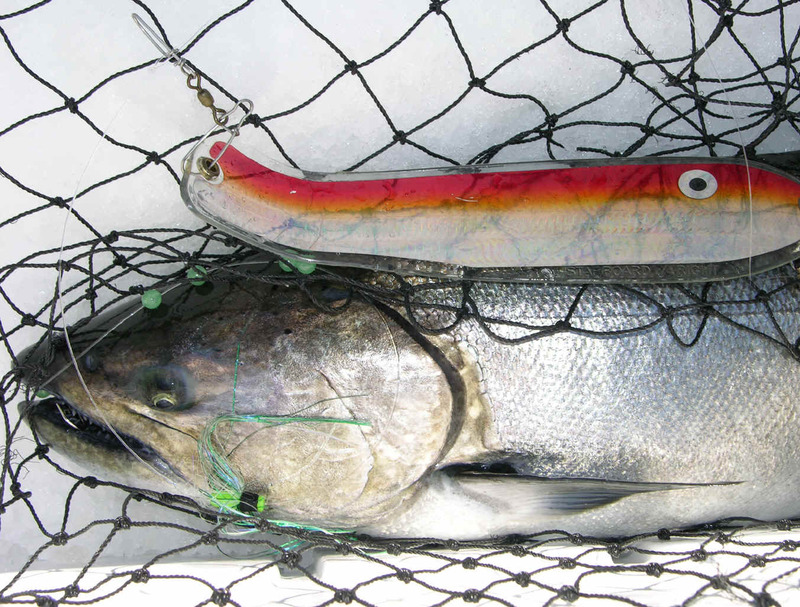 This is the time period when we're dealing with fully maturing adult Coho & King Salmon. Some fully committed to eating and some are just hitting out of an aggressive conditioned response to potential food. Much like river caught adult Salmon that have long since lost the capacity to feed. 1. The eaters Salmon that will take your offering way down it's throat. 2. 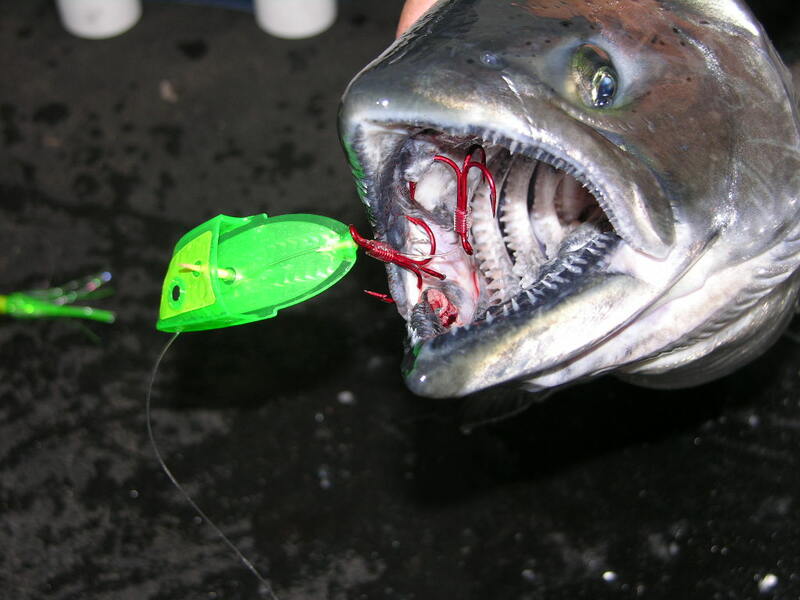 The biters are adult Salmon that will hit a bait with no actual intent on swallowing. Part II will focus on the pernickety biters all hooked around the snout, but not inside the mouth! 1/27/09 It's my firm contention later August and early September Salmon fall into 2 categories. One being fish fully intent on eating. The other is fully adult Salmon that have the urge to just strike out at a lure, but have lost the ability to swallow a meal due to a shrunken belly/stomach. Much like fully mature river Salmon known for not eating. It's my great pleasure to present: Eaters, or Biters part I with photos to anchor my point. 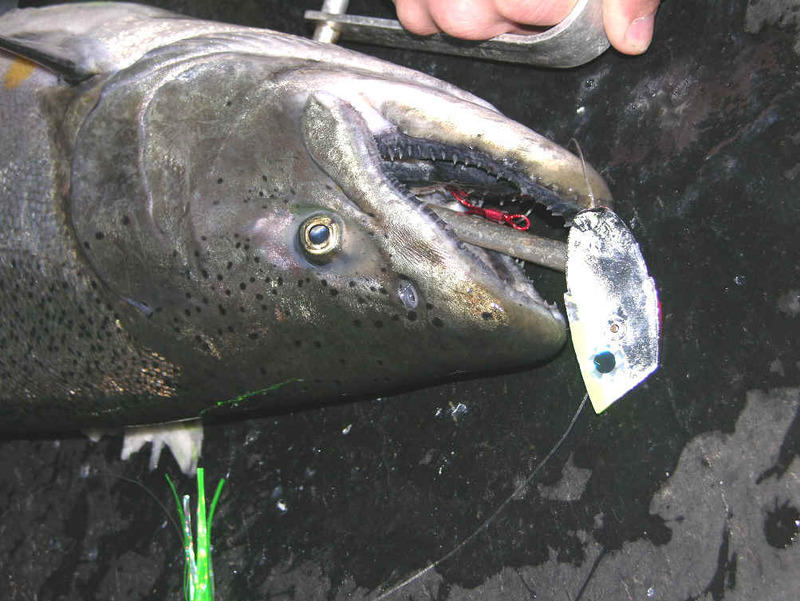 There is a major difference in temp, with eater Salmon in the 52 to 38 and the slap happy just biters up higher in the water column in 63 to 55 degree range. Differentiating the water zones mean we could box out using several depth settings from 50' to 125' down. Making use of a large 75' vertical section of water productive and catching fish in the very wide range temps from 38 to 63 degrees. Now, that's one helluva a program! More on this intriguing observable reel-facts as we march forward towards the 2009 season!